The park is located along the 98th meridian on the edge of a natural transitional zone between prairies and hill country, an area historian Walter Prescott Webb referred to as part of an “institutional fault” that reached from Texas to the Dakotas. CCC Company 1827, comprised of World War I veterans, developed the park using local limestone and timber, primarily oak and cedar. The NPS designs are recognizable in the impressive refectory, which features ashlar-cut stone, arched entryways, a stone chimney, beamed ceilings, an open-sided pavilion, and an overall horizontal massing that visually ties the structure to its hillside setting above Lake Bosque. The refectory, which includes restrooms, a concession area, and stone stairways, serves as a transition from the park to the lake, the key landscape feature of the site. 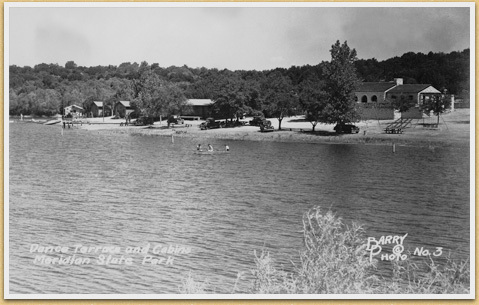 The enrollees also constructed the rock and earthen dam across Bee Creek that impounded the lake. Credit for the park’s design goes to architects and planners Paul R. Roesle, Olin Smith, E.A. Dixon, and John W. Wilder. Entrance Portal, Roads, Water Crossing, Vehicle Bridges, Culverts, Lake Dam, and Concession Building, which included a Pergola. The CCC-built Barbeque Pits are no longer in use. Picnic Tables and a Bath House were designed but not built.